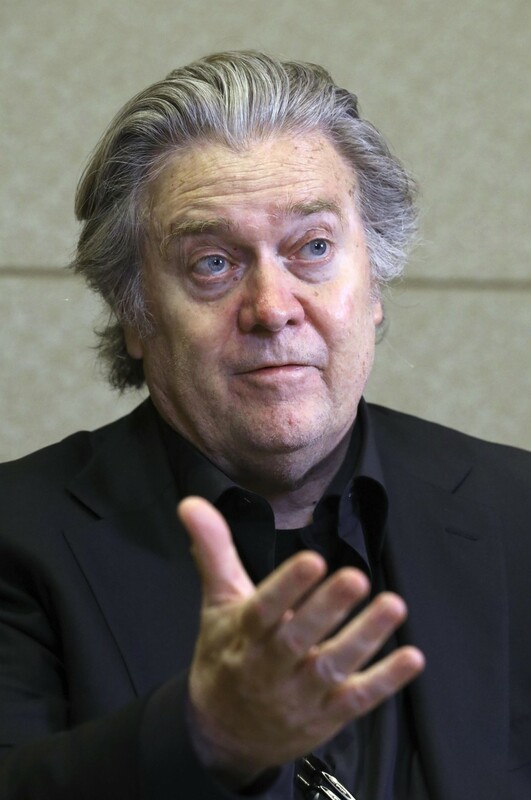 TOKYO – If U.S. President Donald Trump survives multiplying investigations into his campaign and business dealings, he will achieve a “bigger win” in the 2020 presidential election than in 2016, Steve Bannon, former chief strategist to Trump, said Wednesday. “I think he becomes battle-hardened and actually tougher and actually meaner,” he said, projecting that Trump could win by 320 to 325 electoral votes. Trump beat his 2016 Democrat opponent, Hillary Clinton, by 304 electoral votes to 227. Earlier Wednesday, Bannon told a Tokyo audience that while the Democrats would seek to “weaponize” their investigative powers and special counsel Robert Mueller’s report on possible Russian interference with the 2016 election, there was “zero collusion” between Russia and Trump’s campaign. In the interview, Bannon cautioned that victory would depend on Trump fulfilling his campaign promise to build “the wall” across the U.S. border with Mexico which Trump says will stem the flow of illegal immigrants, drugs and crime. Trump’s opponents have decried the project as ineffective and racist. “I told him from the very beginning, we don’t build the wall, you’re not going to be president in 2020,” he said. “He’s got to plow forward with trying to build the wall” and he needs “some organized attempt” to show his base that he is prepared to fulfill his promise if not a number of border miles completed. With Trump’s Feb. 15 declaration of an emergency at the border to secure funds to build the wall likely to be nullified by Congress in coming days, the president is poised to exercise his veto. If that veto is overridden by Congress, it will be “enormously damaging” to the president, he said. Bannon said the working class, which helped Trump’s win, will continue to support him because of a strengthening economy and rising wages. He also argued Democratic Party presidential candidates’ shift to the left under the influence of young progressives gives an opening for Trump to exploit. “You’ve seen the radicalization of the Democratic Party in taking relatively mainstream politicians like Kamala Harris and pull her to the left and I think it opens up an opportunity for President Trump and I think President Trump’s really going to contest this,” Bannon said, implying that he believes the shift has been too extreme for the American electorate. Regarding Trump’s recent summit with North Korea’s leader Kim Jong Un in Hanoi, which ended without an agreement on the country’s denuclearization, Bannon said the meeting was not a failure. “I don’t think Hanoi was a defeat at all or a loss of opportunity,” he said, adding that there is more engagement between the two countries and that Trump has put more issues on the table with North Korea such as chemical and biological weapons. WASHINGTON – President Trump’s former chief strategist predicted a “nasty” year ahead for the commander-in-chief who faces an onslaught of political and legal troubles. Bannon, who was ousted from the White House in 2017, cited the upcoming release of special counsel Robert Mueller’s Russia report, the ongoing investigation into Trump’s inaugural committee and House Democrats’ congressional oversight as upcoming landmines. “I think the next 90 days to four months is going to be a real meat grinder,” said Bannon, who also was Trump’s campaign CEO in 2016. The former White House strategist Steve Bannon has stepped up his campaign against the Pope by threatening to take legal action over the Vatican’s decision to allow the Chinese government to jointly appoint bishops. Mr Bannon, 65, said that he was calling in lawyers to challenge the agreement made in September. He used a live online video to appeal directly to Chinese Catholics.